Great startups can come from anywhere in the world. One of the Fellowship's goals is to make it as easy as possible for founders to start companies with strong foundations, no matter where they're located. It’s one of the reasons why we’re designing a program that founders can participate in without having to move to Silicon Valley. 1) Access to the largest pot of seed capital in the world. U.S. investors tend to avoid investing in foreign entities. 2) It’s easier to collect revenue with a U.S. bank account in the U.S. market, which for most of our companies is still the largest market for them to go after. Today, Stripe announced the launch of Atlas, a beta program designed to streamline the process of getting the basic building blocks of starting a company assembled without hassle. In partnership with Stripe, we’ll be offering Atlas to future Fellowship companies located overseas. Stripe initially joined YC to rethink how payments on the internet should work. Now they’ve rethought what borders mean for business. We’re delighted to be working with Stripe to make it easier for our international founders to spend more time working on their startup and less time on paperwork. Last fall, YC ran an 8 week experiment called The Fellowship to fund and work with startups at the idea or prototype stage. The goal was to see if we could create a program that could help more early-stage startups at scale. The experiment went well and I have a few annoucements about its future. We’re going to do it again. In fact, we’ve already picked the companies for the second batch and we’re opening up applications for the third batch starting today. We’re going to make it possible to apply to both the Fellowship and YC core program via one application. We’re iterating quickly on the format and so the second and third batches will have a very different experience from the first. We’re going to be taking equity. I’m going to address these in reverse order. From this point forward, we’re going to provide more money per team and take some equity in exchange. However, we’re going to try something we’ve never done before. The new terms for the Fellowship are as follows: We’re going to provide $20K for 1.5%. Instead of taking our equity up front, we’re going to be issuing a convertible security that only converts into shares when the company 1) has an IPO or 2) has a funding event or acquisition that values the company at $100M or higher. Basically, YC only wins if you win big. I’m pretty excited about this because it’s both founder friendly and pushes us to build a program for the long term—not just one that is a lightweight version of our traditional model. It will be primarily experienced remotely. This is so teams can spend as much time on product and customer development as possible. Office hours will be done over Skype or phone. We will bring all the teams together once, but only at the beginning of the cycle for an all day Kickoff Conference that will combine many of the workshops we provide our startups in the core batch into a single day. Fellowship teams will have a dedicated YC partner following their progress throughout the program. We'll also be visiting areas where multiple teams are located. For example, I'll be meeting teams in the Bay Area, Philadelphia, New York and Austin for the second batch. We’re going to host weekly talks with speakers that we stream live to companies online. This will allow us to invite speakers that can't come to YC in person. At the end of the program, the startups will be able to present their progress at a Virtual Demo Day to investors. If a Fellowship team decides to apply to the YC Core program, we'll provide early decision information about their interview status. We were surprised at how popular the program would be. We gave very little notice up front for the first iteration and only opened up applications for a single week, but we got nearly the same number of applications for YC Core—over 6K! Once we realized we were going to do the Fellowship program again, we decided it would not be efficient for us to have separate application cycles and reading periods for the YC Core and for the Fellowship. Since that test went well, we’re going to make it possible to apply to both or either program through a single application. When you apply, you'll see a question on the application that'll let you apply to both or either program. If you're at a stage that is prior to product market fit, we recommend just applying to both. After our experiment finished in the fall, 22 of the 32 startups that participated in the first Fellowship batch elected to apply to YC Core program and 6 of those companies are now part of the current Winter 2016 batch. To test out our single application idea, we used the last application cycle to identify and invite teams that would be a good fit for the Fellowship to join the second batch. We ended up accepting 31 companies and they’ll be going through the new format starting February 1st. If all goes well, we hope to scale it up quickly on the next iteration. Speaking of which, applications are now open today for both the third Fellowship batch and the YC Summer 2016 batch. If you’re interested, apply here. Last year, we tried our hand at some new experiments to provide 1-on-1 advice out in the open. We've done this a few times on stage at Startup School, but we figured Hacker News might be a better way to do it at scale. We had such a good experience that we've decided to now do them every month. Each month, a different pair of YC partners will host office hours on HN. They'll either be feedback on Show HN projects or answering questions voted by the community. We'll be starting with Michael Seibel and Aaron Harris on Jan 22 at 11am PT. Michael and Aaron will be doing the office hour format on the 22nd. If you'd like help with your startup, on the day of the online office hours, post a top-level comment with a one or two sentence description of what you do and the first thing you'd like to talk about. The community will vote, and Aaron and Michael will answer the top questions. We'll announce the time/day/format of the HN office hours the week before they happen through a Tell HN and then the day of put up a new thread (if it's a office hour format) for people to post their questions. If it's a Show HN format, the partners will just add their feedback to the individual Show HN posts and we'll put up an aggregated set of links when we're done. 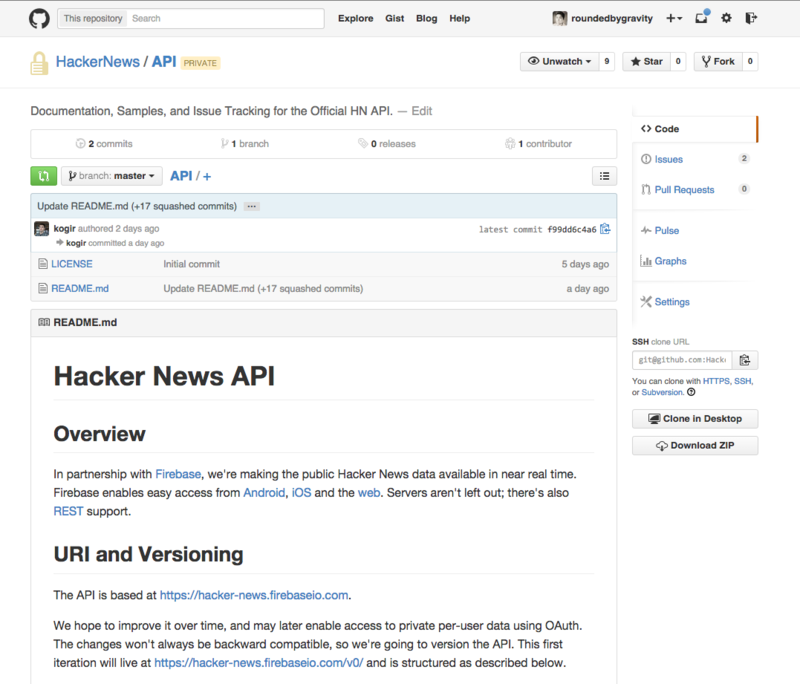 Today we’re excited to launch an official Hacker News API. We’ve partnered up with Firebase (YC S11) so that the data we’re making available will be near real time, which should be a huge improvement for developers who had to rely on scraping the site for this info. The API is available at https://hacker-news.firebaseio.com/ with some initial documentation and a few examples written by our own Nick Sivo on the Hacker News Github account. Currently, it’s read only, but we hope to improve it over time and may later enable access to private per-user data using OAuth. Most importantly, the reason we released an API is so that we can start modernizing the markup on Hacker News. Because there are a lot of apps and projects out there that rely on scraping the site to access the data inside it, we decided it would be best to release a proper API and give everyone time to convert their code before we launch any new HTML. Our goal is to switch to a new rendering engine (still powered by Arc) in three weeks (Oct 28). This new markup will allow us to iterate faster on the frontend and finally make Hacker News mobile optimized. This is one of the reasons why we chose to partner with Firebase. In addition to giving developers near real-time access to our data, we got out of the box well designed, easy to use SDKs for iOS, Android and the Web, in addition to a REST API for developers building server apps. It should hopefully make switching your apps fairly painless. Many thanks to the YC Software Team for making this happen (specifically kogir, dang and sctb). If you have any questions or feedback about the API, you can send them over to api@ycombinator.com. Our website got a facelift. The content is pretty much the same. Since the old site was mostly text, I did my best to just make that text easier to digest and hopefully entice people to get through more of it. A lot of the best content on the site like What Happens at Y Combinator and How to Apply Successfully went largely unread because a number of people were either intimidated by the wall of text or didn't have the patience to read through it. The new site is responsive, but if you're viewing it on a mobile phone right now, I want you to know my favorite way to go through it is on a large monitor. 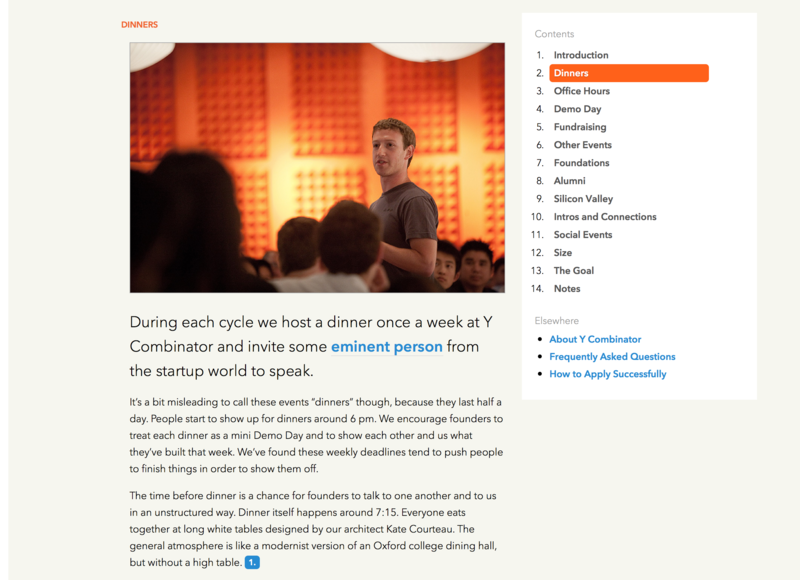 For posterity, we preserved the old version of the site at http://old.ycombinator.com. If what you see makes you worried for Hacker News, I want you to know that I have very different design goals for HN. Many thanks to Nick Sivo for helping me dig through the server to find everything I need. We're still making tweaks and changes, so if you have feedback on things you think we should improve, please let us know!